When my amazing bookkeepers Mum decided to come to Canberra for her wedding she reached out to me to see if I could work my creative magic and create some gorgeous florals and setup some floral decor at the venue. Now Debbie is one cool cat! We sat down to talk and we ended up spending hours chatting away. Debbie told me about how she met Dave, about how she found love again and the lengths as well as physical miles they travelled to be together and it's truely the sweetest love story. Debbie gave me a few requirements, she wanted a small bouquet in deep reds and white to tie in with her champagne dress and her bridesmaids dress that was a deep burgundy red and the rest she left up to me. The end result, a combination of lisianthus, tulips and freesias and local red roses the ones with that divine old fashioned rose smell. It’s not often the I end up featured in a photo, I usually like to be the one behind the camera. This behind the scenes photo captures so much. For me creating is like an extension of myself and everything I make has a little piece of me in it, I spend hours designing and creating to make it perfect. When you finally show someone what you’ve made, it’s like opening yourself up and showing off all your deepest darkest secrets. This photo captures such a raw moment, it’s the moment when I finally get to share what I’ve created for my client and see that they love it as much as I loved making it. A snap shot of me working away on one of the many 6 meter long garlands I did up for this wedding a little while back. 1. How long have you been thinking about your wedding? d. I was never even sure I’d have one! 3. What is your dream venue? 4. How many bridal magazines do you have right now? 5. What would be the perfect date night? 6. What is your favourite romantic movie? 7. What’s your favourite flower? 8. What does your dream wedding dress look like? 9. What tradition are you ditching? 10. What is your dream honeymoon location? You love a timeless look, and your wedding will still look picturesque in years to come. You love the idea of a traditional ceremony - stunning! You’re edgy and fun and you naturally gravitate towards colour. Your ceremony is super quick and the reception will be super fun, because all the people you love are in one place having a great time. Your wedding is colourful and unforgettable. - Rockin' it! Bronwyn & Lyle were married in April this year at Mt Stomlo Observatory. This wedding was super fun to create with lots of bright colours to work with. Bronwyn & Lyle chose a bright, fun colour scheme, which really suited their fun personalities. In the bouquets I used combination of peonies, roses, billy buttons, stock, sweet william and tulips in hot pinks, yellows, oranges and deep purples. We got the opportunity early this week to join an amazing group of wedding suppliers to make Kathie’s dream come true to marry her love Adam with her beautiful daughter Annabelle as flower girl. Many of you may have heard of 3 year old Annabelle Potts who was diagnosed with a terminal brain tumor late last year. We are grateful to have been a part of such a special day for this lovely family. Meghann & Dave were married in early autumn this year at Meghann’s parents farm just outside of Canberra. Meghann had been living over in Canada for the past few years with her Canadian Fiancé but chose to come back to Australia to have her wedding. I knew Meghann growing up, we went to the same school a few years apart and her parents live just down the road from the house my partner grew up in. I was excited when I found out she was getting married and thrilled when she asked me to do her flowers. Meghann and Dave chose a pastel pink and white colour scheme, which looked divine. In the bouquets I used David Austins, Garden Roses and lisianthus in a gorgeous colour palette of soft pinks and ivory with flowing soft grey eucalyptus foliage. Words cannot even begin to describe the sweet fragrance from these bouquets. It was heaven creating them. As I drove up on the morning of the wedding to deliver the flowers I had to catch my breath, the view was picturesque. The driveway was cobbled with trees lining each side, there was a rosiness to the leaves that hinted to the beginning of autumn in the air. When I arrived her mum greeted me, we chatted for a while and you could tell she was elated that her daughter was here in Australia, getting married in the gorgeous place she grew up. After dropping off the flowers her mum gave me a sneak peek at the location the ceremony would be held and the beautiful rolling hills that would featured in the background of their ceremony. There are many beautiful places to have your wedding in Canberra but there was something so special about seeing Meghann get married here in her old home. Tiahn & Andy were married in early autumn this year. When they first came to me Tiahn & Andy had no idea what they wanted when it came to flowers. So when they came to their consult with me I spent time with them really getting a feel for their style and personalities and understanding what they wanted their big day to be like. I guided them on choosing flowers in a colour scheme that worked in with their theme and would look lovely against the navy blue dresses picked out for the bridesmaids. In the end we came up with a classic styled bouquet for Tiahn and her bridesmaids with white sim carnations, peach carnations, white snap dragons, white freesias and white lisianthus with ivory satin ribbon and pearl headed pins to finish. The funniest part was on the day a very nervous groom put on the lapel corsage meant for his mother and she had his buttonhole! It turned out to be one of the funniest stories of the day. After Tiahn told me this story I now make sure to label all the items, I’m so used to making corsages and buttonholes I forget not everyone has seen one or had a chance to wear one before! Our first wedding of the year, and what a way to start. The day was absolutely perfect, and the love between Janaya and Scott was palpable! When I arrived to drop off the flowers, I found Janaya dressed to the nines in her stunning gown with sneakers on! She’d just been out getting pre wedding shots done out in the paddocks at Poacher’s Pantry. The flowers for Janaya's bouquet were a gorgeous mix of roses and dahlias with soft grey dusty miller foliage. For the tables we used Dahlias in Mason Jars to tie in with her bouquet and the rustic theme of the wedding. Flowers: Orchid and Vine Florist | Photography: Henry Paul | Venue: Poacher's Pantry | Dress: Affordable Bridal, Gundaroo NSW | Hair: Steven Lloyd | Makeup: Zoe Barton | Shoes: Shoes of Prey | Suits: Roger Bartholomew | Entertainment: Jake Edgley | Catering: Poacher's Pantry | Celebrant: Amanda Corbett. It was an absolute treat to do Jola and Nick's Wedding. I have known Jola since we were 5 years old, we went to school together through Primary School and High School, so it was really special to be able to make the flowers for her big day. Jola loves yellow (good choice! 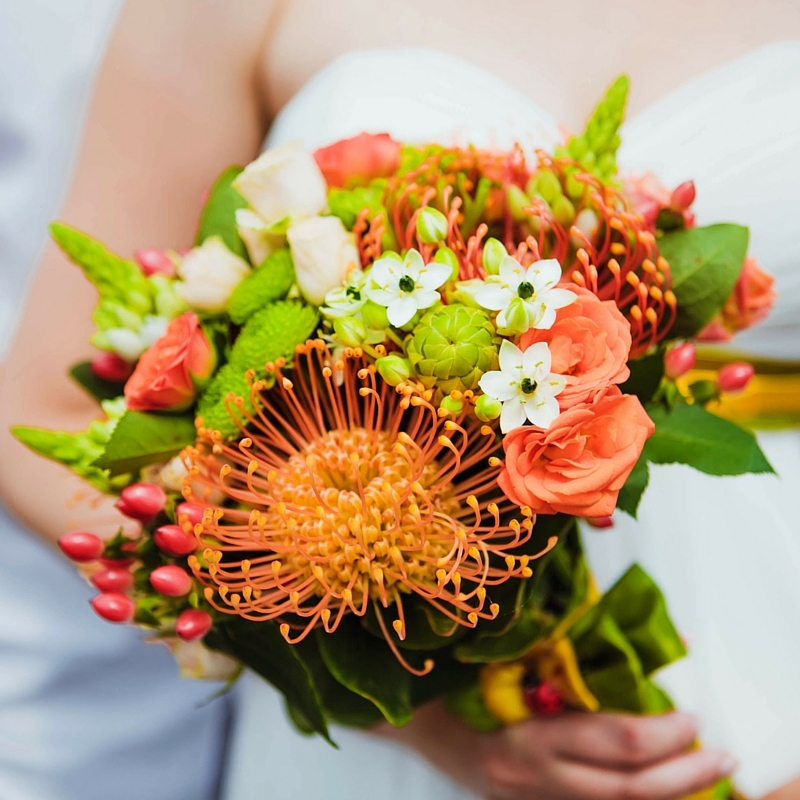 it's my favourite too) so we made sure her bouquets shone like the sun with a gorgeous selection of roses, sunflowers, and orchids, with lots of lush foliage a few succulents added in for some added texture. Jola had a gorgeous trail to her bouquet which really set her apart from her bridesmaids which held classic posies in matching her theme. All the bouquets were wrapped with Navy ribbon to compliment the girls dresses and the bridal bouquet had trails of ribbon that accented the trail of the flowers. The ceremony was held at the beautiful Gold Creek Chapel followed by a reception at the Lobby where we used crosscut wood logs with a scattering of yellow flowers in little vases to sit upon each of the tables. It was lovely creating the flowers for Matt & Steph's beautiful Spring wedding. Matt and Steph choose the National Gallery of Australia as the venue for their big day and it couldn't have been more perfect. They had a stunning outdoor ceremony out in the Sculpture Gardens surrounding the Gallery followed by an intimate reception at Gandel Hall. The choice of flowers really complimented Steph's beautiful dress and we were able to incorporate the same flowers into the bridal arbour that was featured at their ceremony.